right key. Optical experiments are also performed to validate them. bility and speed of the experimental process. 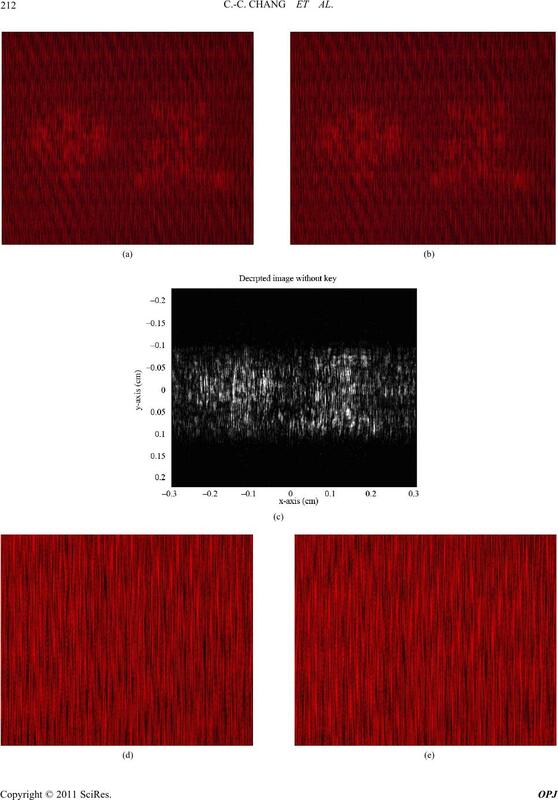 dom-phase encoding in the Fresnel domain. 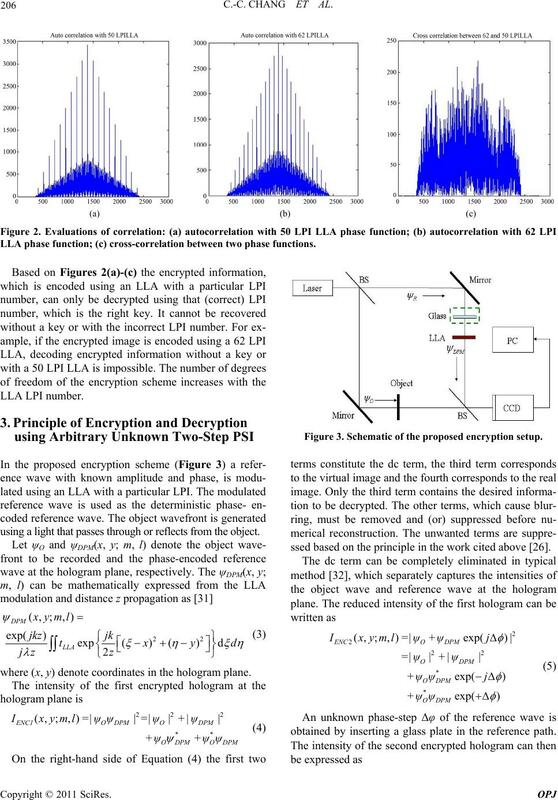 reference wave in encrypting the object wavefront. to object illumination by the object beam is negligible. This assumption obviously applies to image encryption. where LPI is the LLA density. tLLA(ξ, η; m, l) and tLLA(ξ, η; m’, l’) ,. relations s(ξ, η) are presented in Table 1 . Table 1. Parameters of 50 and 62 LPI LLA. Figure 1. Side view of a lenticular lens array. LLA phase function; (c) cross-correlation between two phase functions. using Arbitrary Unknown Two-Step PSI Figure 3. Schematic of the proposed encryption setup. ssed based on the principle in the work cited above . using a light that passes through or reflects from the object. where (x, y) denote coordinates in the hologram plane. obtained by inserting a glass plate in the reference path. ties of the two holograms and the estimated value of Δφ. and with the right key. not successfully decrypted in this case. grams with the aid of a wrong key. the encrypted information cannot be decrypted. key, as shown in Figure 4(g). used as the right key and the wrong key, respectively. is set to 1.30 radians. without phase-step; (i) second right key hologram with phase-step 1.30 radians; (j) decrypted image with right key. 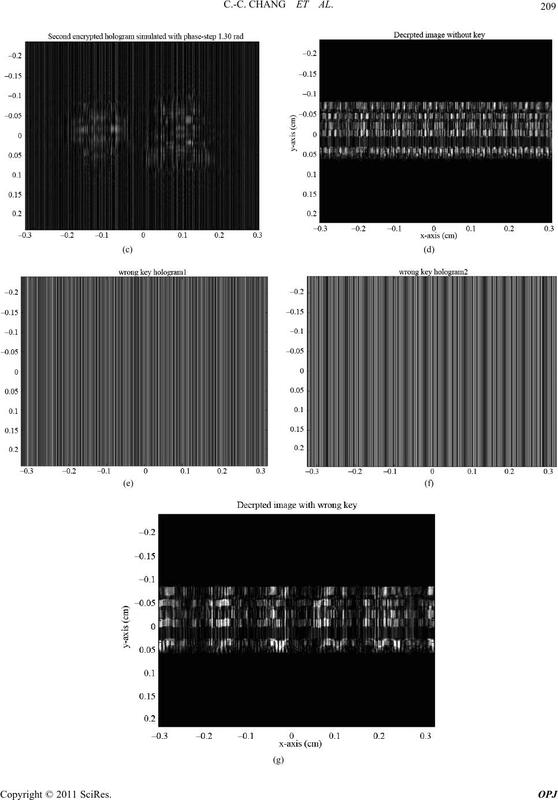 mean square error and SNR of the decrypted images. 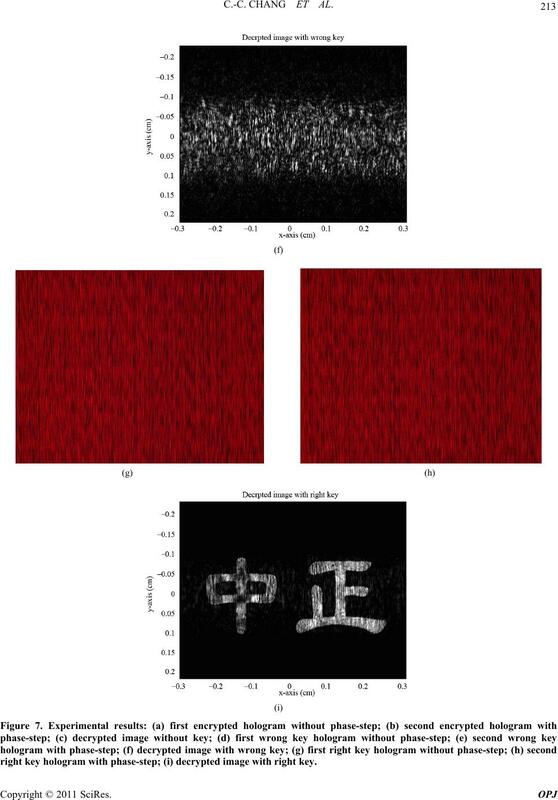 0.0119 and 19.25 dB, respectively, as indicated in Table 2.
cm) was used to acquire the holograms. reference path before the second hologram was captured. 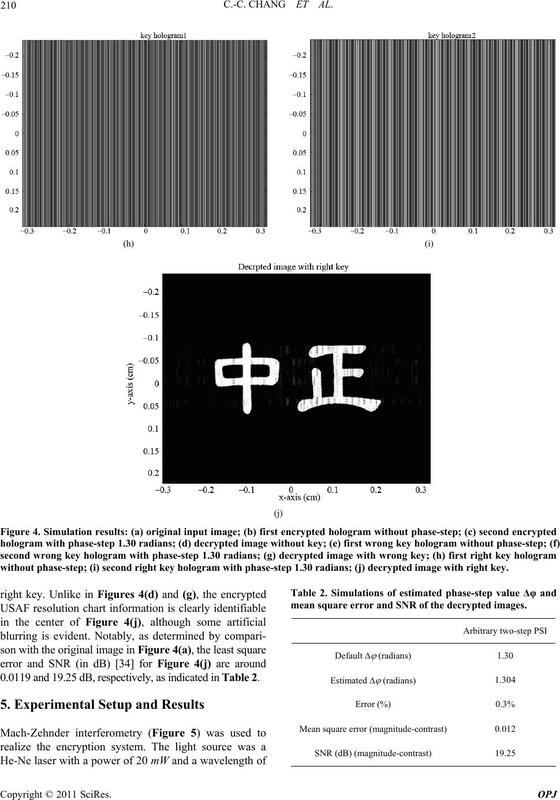 Two Chinese characters (Figure 6) were encrypted. plane wave using the arbitrary two-step PSI technique. mated from Equation (9) to be around 0.1380 radians. directly reconstructed using Equation (12) without a key. Figure 6. Original optical image to be encrypted. 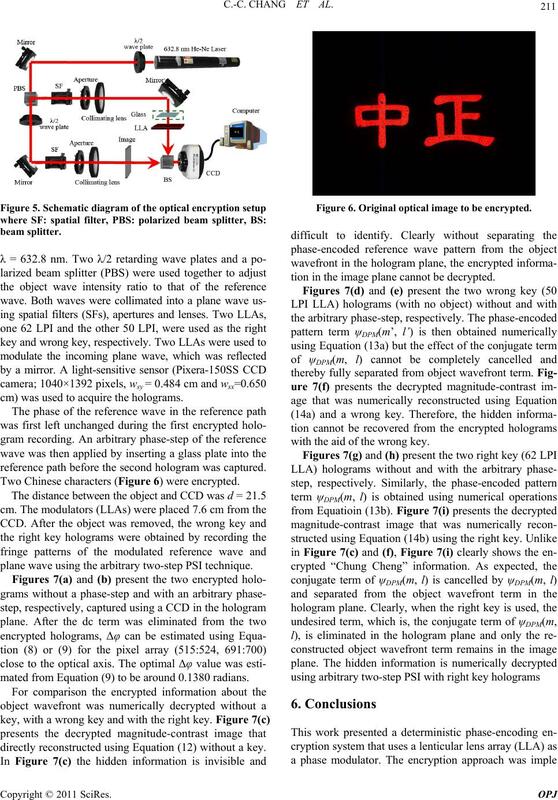 tion in the image plane cannot be decrypted. with the aid of the wrong key. 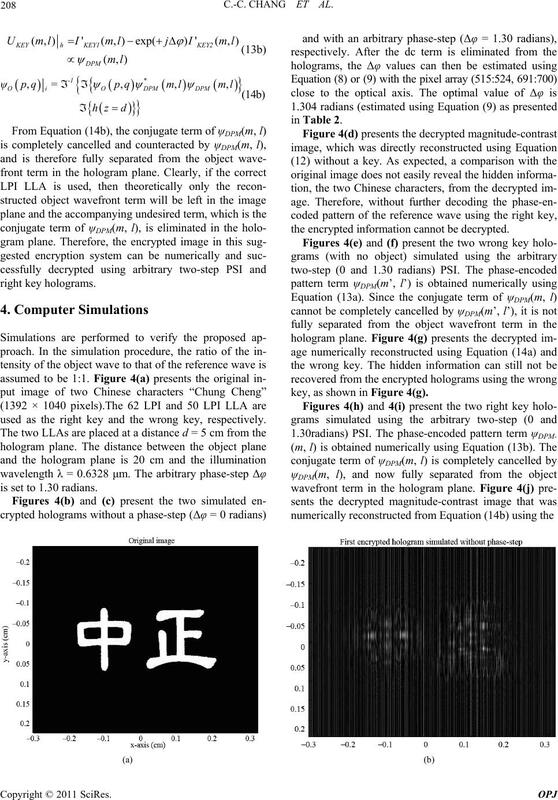 right key hologram with phase-step; (i) decrypted image with right key. not easily accessible by an unauthorized person. plied Physics Letters, Vol. 11, No. 3, 1967, pp. 77-79. 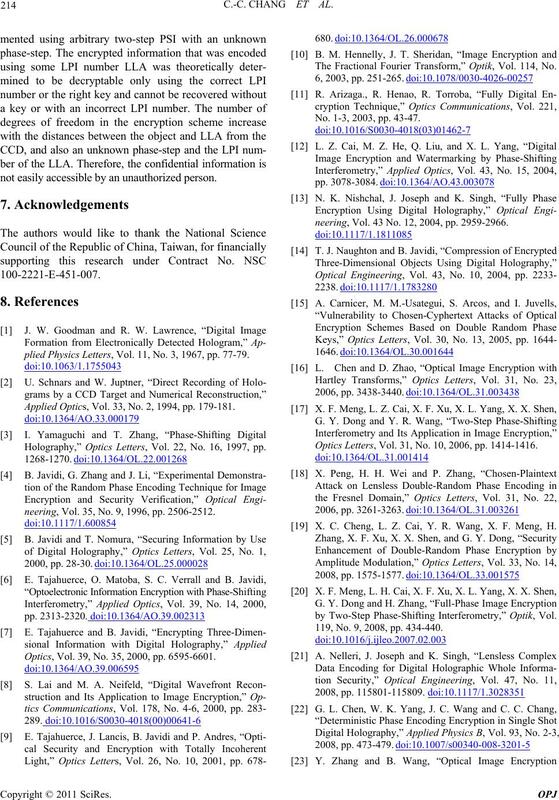 Applied Optics, Vol. 33, No. 2, 1994, pp. 179-181. 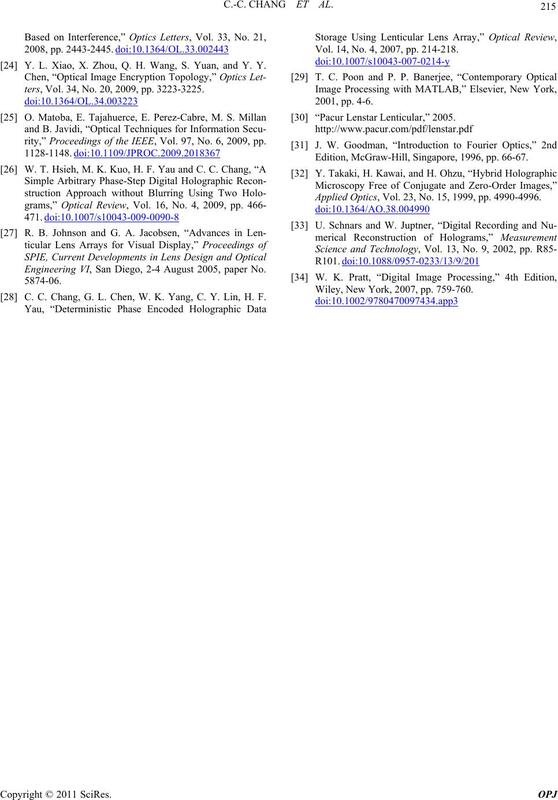 Holography,” Optics Letters, Vol. 22, No. 16, 1997, pp. B. Javidi, G. Zhang and J.
neering, Vol. 35, No. 9, 1996, pp. 2506-2512. Optics, Vol. 39, No. 35, 2000, pp. 6595-6601. 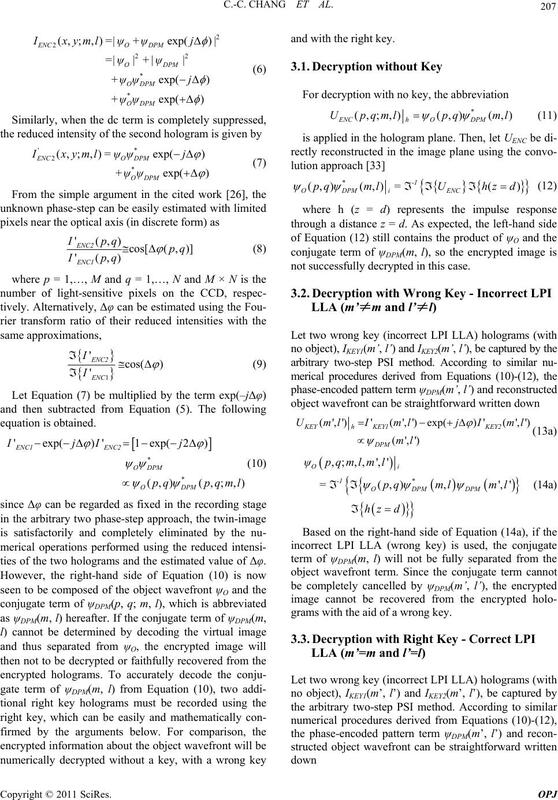 The Fractional Fourier Transform,” Optik, Vol. 114, No. No. 1-3, 2003, pp. 43-47.
neering, Vol. 43 No. 12, 2004, pp. 2959-2966. 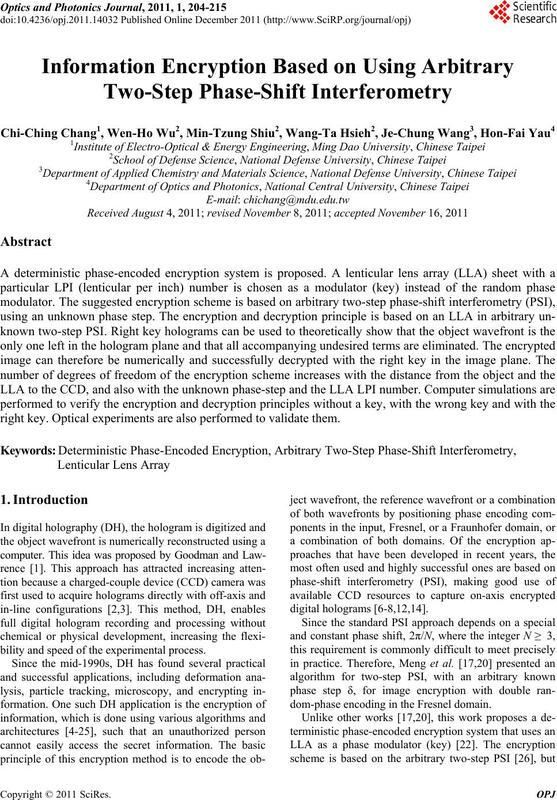 X. C. Cheng, L. Z. Cai, Y. R. Wang, X. F. Meng, H.
by Two-Step Phase-Shifting Interferometry,” Optik, Vol. 119, No. 9, 2008, pp. 434-440.
ters, Vol. 34, No. 20, 2009, pp. 3223-3225.
rity,” Proceedings of the IEEE, Vol. 97, No. 6, 2009, pp.
. K. Yang, C. Y. Lin, H. F.
Engineering VI, San Diego, 2-4 August 2005, paper No. Vol. 14, No. 4, 2007, pp. 214-218. Edition, McGraw-Hill, Singapore, 1996, pp. 66-67. 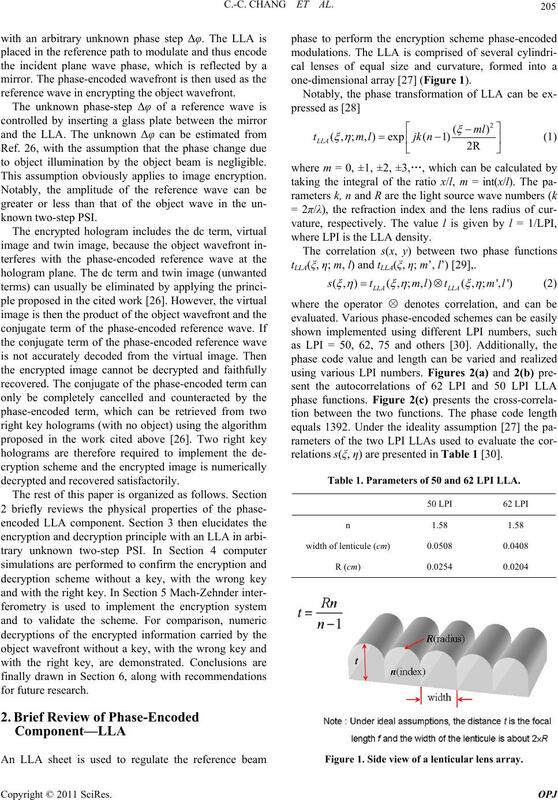 Applied Optics, Vol. 23, No. 15, 1999, pp. 4990-4996. Wiley, New York, 2007, pp. 759-760.